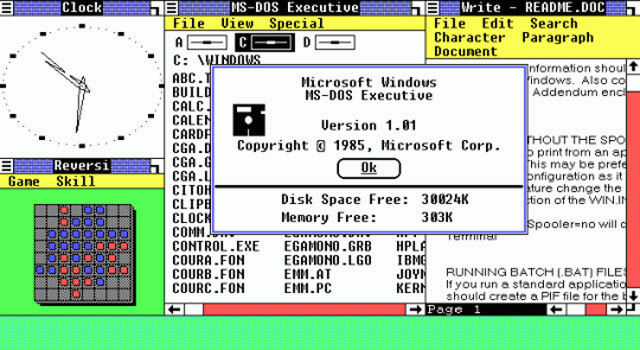 Today is a big birthday for Microsoft Windows, as the iconic operating system turns 30. While there have been numerous incarnations of Windows over the years -- we are currently on Windows 10 -- and the company faces a world of competition from companies like Apple, back in 1985, the program marked a major turning point in personal computing. Its clear, user-friendly, mouse-controlled interface became a home computing staple. As Windows blows out its digital, pixilated birthday candles, it's easy to cue up the 1980s nostalgia. As Bill Gates introduced the system at a company event in 1985, what else was going on in popular culture? From "Calvin and Hobbes" to "We Are the World," here's a quick walk down memory lane to five other things that made waves in 1985. Biggest movie: "Back to the Future"
The biggest movie of 1985 was "Back to the Future." The film, starring Michael J. Fox, has become a certifiable classic, spawning multiple sequels. What explains the appeal? Mashable's Annie Colbert told CBS News that its light, fun tone struck a chord. "It predicted the future with playfulness," she said. "It wasn't apocalyptic -- it was accessible. It's also about technology. It's 2015, we're obsessed with technology." Iconic song: "We Are the World"
What does an eclectic group like Bob Dylan, Tina Turner, Smokey Robinson, Bruce Springsteen, and Dan Aykroyd -- yes that name does stand out starkly from the others in the list -- have in common? They were part of the large group of performers who made up USA for Africa, a one-time supergroup who got together in 1985 to record "We Are the World," the song written by Michael Jackson and Lionel Ritchie. The song was recorded to raise money for famine relief in countries like Ethiopia. It was the first single to be certified multi-platinum. It was one of the key discoveries that sparked growing concern about the climate and spurred efforts to cut back on carbon emissions. In May 1985, British Antarctic Survey researchers announced that they found a hole in the ozone layer that had been opening up since the 1970s. The team reported that chloroflurocarbons (CFCs), found in many products at the time like hairspray, were degrading the planet's protection from the sun. The findings led to widespread efforts to replace CFCs with substitute materials, and the hole has been shrinking ever since. On Nov. 18, 1985, "Calvin and Hobbes" began its 10-year run, illustrating the exploits of young boy Calvin, named after a certain 16th century theologian, and pet anthropomorphic tiger Hobbes, who shares the same name as a 17th century political philosopher. While aimed at children, the comic strip's literary tone and smart, insightful writing caught on with adult readers, too. In 1985, gifted artists and stick-figure-illustrators alike were introduced to the ultimate party game. Seattle Games released Pictionary, which involves one player drawing an image as other players try to guess what phrase or word it's showing. While other 1980s inventions might look like dinosaurs to some, this low-tech game has stood the test of time.